Couples around the world celebrate St. Valentine’s Day on February 14. Looking at this celebration of love with Lent in our sights, rather than in and of itself, unveils a far more profound understanding of covenantal love. As the Lenten season follows on the heels of this famed homage to love, a deeper reflection on true love is a worthy endeavor. 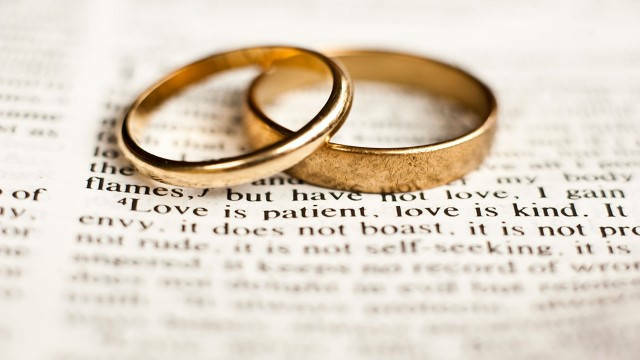 Two texts form the basis of the Church’s teaching on marriage, both of which are inspired by Jesus’ discourse with the Pharisees in the Gospel of Matthew chapter 19. The first is Genesis chapters 1 and 2, quoted directly by the Lord in Matthew 19: 4-6. Jesus alludes to God’s original intent for creation in Matt 19:4, referring to “the beginning”. It culminates with Ephesians 5:25, in Christ’s surrender for our salvation. This provides the theological lens by which to understand matrimony in both its physiological and sacramental character. To cultivate a genuine appreciation of this Sacrament, we must contemplate Genesis 1 thru 2 and Ephesians 5:21-33 to see how these texts relate to one another through “the Word made Flesh” (Jn 1:14). Together, these reveal humanity being created by and for love, and redeemed through sacrificial, unconditional love. Every Sacrament of the Church is instituted by God as a tangible manifestation and perpetuation of Christ’s saving work in history. Thus, each Sacrament must necessarily make known and make present both the redemptive and divinizing characteristics of salvation. Here is where we see the connection between Genesis and Ephesians. When God becomes flesh in the person of Jesus Christ, the flesh is imbued with the very essence of divinity and is revealed as capable of transmitting the transcendent. This is the enabling force which provides for unconditional love and self-giving through joy-filled and treasured moments as well as disappointments and betrayals. As such, everything that is properly human has now become the means of God’s self-communication and revelation in the world. This is why St. Augustine can claim with all boldness, “God became man so that man might become like God!” And St. Irenaeus can say with surety, “The glory of God is the human person fully alive!” But, how does this dual-purpose of our salvation relate to the topic of marriage and the two texts we are discussing? On the one hand, when a man and woman enter into the sacred bond of matrimony they are re-establishing the redeemed love of Adam and Eve which was lost in the Garden of Eden. The husband and wife are concrete signs to themselves and to the world that God has fulfilled His promise to restore the fallen creation of Genesis chapters 1 and 2. The couple is also a living icon representing the undying and eternal divine marriage established between Christ and the Church on Calvary. St. Paul, makes this fact abundantly clear when he exhorts husbands to love their wives “even as Christ loved the Church and handed himself over for her” (Eph 5:25). The Apostle reminds us that Christian marriage is a divinizing reality, a substantiation of that great union which has been sealed by the blood of Christ. Now, every activity of a Christian husband and wife; their heart-filled embrace, their parting kiss, their joint gaze upon a newborn child…each of these are making present God’s divine love in the world. The crisis of marriage in our country is a direct result of forgetting these profound truths. Marriage construed apart from its sacramental character becomes a contract, but marriage understood in the light of Christ’s sacrifice is a covenant which ranks among the most awe-inspiring and wonderful things in the world. USCCB Videos about the beauty of marriage.